Wow – these are some backyard goals to attain!! Huge lot…Big views…Warm spa and a well trained plant on a beautiful trellis – all this plus a great patio right off the great room! Welcome to our new listing – all this can be yours! Come see it next week! 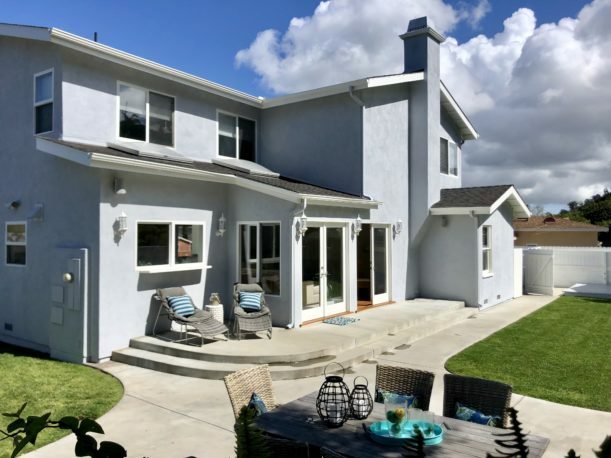 We will have this spacious home complete with 5 bedrooms / 3.5 bathrooms and approximately 2478 Sq Ft open Thursday, March 28th from 12-2pm; Saturday, March 30th from 1-4pm and again Sunday, March 31st from 1-4pm. You’re gonna love the newly updated great room – it’s got such a cool and beachy vibe! Backyard BBQ’s and play dates will be popular in this sunny back yard! South Bay living at its finest! Plus you can participate in the action from this great room that overlooks the backyard! It is a wonder to me in today’s savvy real estate market where visual images are so important as a first impression that someone would use these photos to market their home that is listed for $1 million dollars!! What the heck? 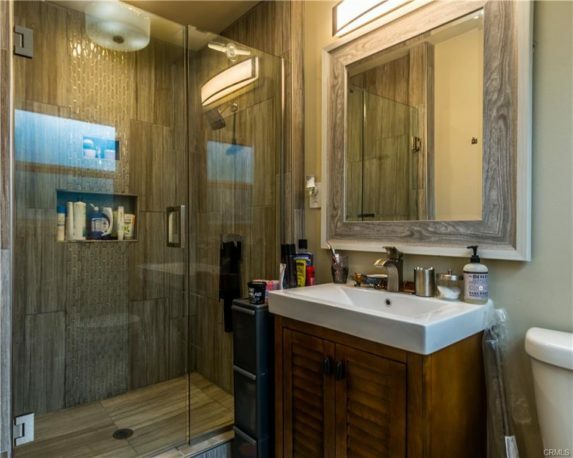 How could this bathroom shot make a buyer want to buy this house? It looks like there is not enough storage space since there is an overflow of bath products on the counter, an extra portable storage bin to the side of the cabinet and some random rod (maybe a towel bar that was never installed?) lying against the bath cabinet. 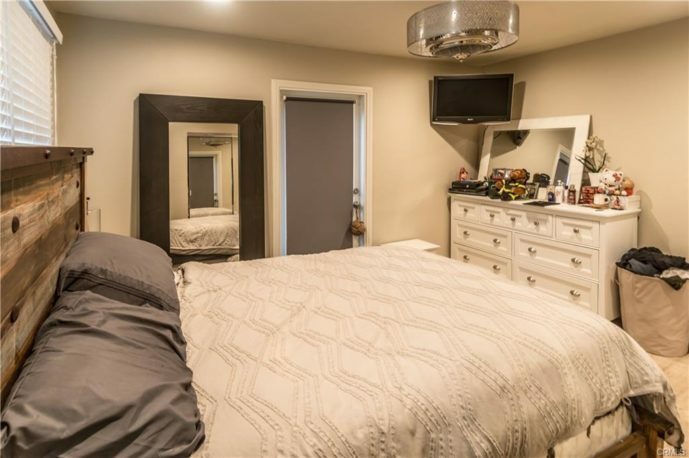 This is the bedroom photo – what the ? Seriously? The dirty clothes hamper is overflowing and shouldn’t even be in this photo to start with. The dresser is covered with more things that should be stored. Again, this photo tells a story that this house has no storage and even the current owner doesn’t know what to do with all the stuff. Clearly this person never read the latest Marie Kondo book having to do with clearing clutter from your life. 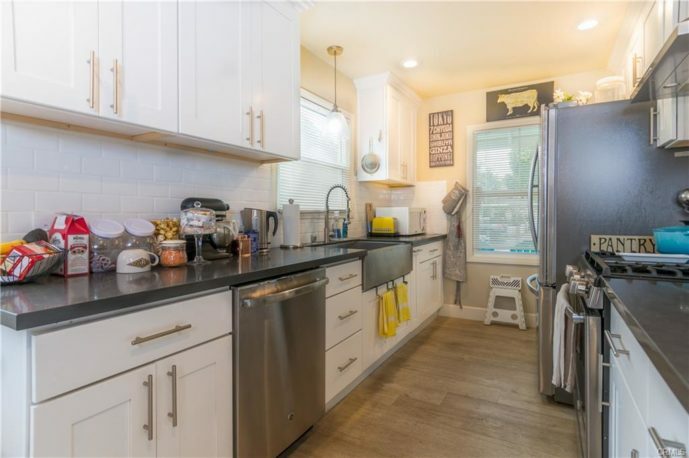 Here is the kitchen photo – obviously the real estate agent did not hire a professional photographer….more overwhelming clutter abounds. It’s such an easy and inexpensive thing to do before you prepare your home for sale….clear the clutter folks! 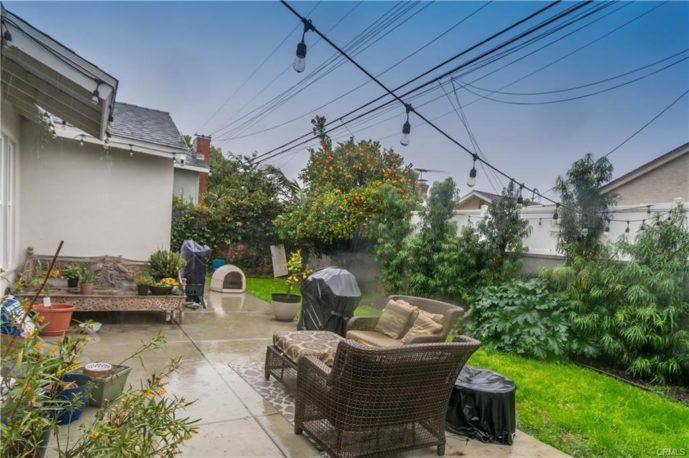 The backyard – ugh – it’s probably a very nice space, but who can tell from these photos. There is a $1 million dollar price tag attached to this home and these are the photos – I think they will be hard pressed to get that price with these photos. Someone could have easily removed the black covers from the outdoor grill and removed all the excess planters and waited for some sun! This home is in sunny, Southern California believe it or not. These guys need help. If you want to sell your house and want a professional real estate agent to advise you on some very easy and inexpensive ways to get top dollar for your home, call Kelly & Laura today. We come ready to work with many years of staging experience under our belts and will personally help you prepare your home for sale. We would never allow photos like this to be a part of your sale. We hire a professional photographer to present your home it its best light. This was not what I was going to write about tonight, but when I opened the MLS to see what new inventory might have come on the market today, I saw this and couldn’t help myself. Yikes! September Slow Down in the Hollywood Riviera real estate market? Statistics don’t lie. We can compare this September 2018 to last year at the same time 2017 and find that fewer single family homes have sold this year – 65 SFR homes have sold in 2018 vs 82 this time last year. When we look at ‘pending’ or how many single family homes in the Hollywood Riviera neighborhood are in escrow – there are currently 6. This time last year there were 14 homes in escrow last year. 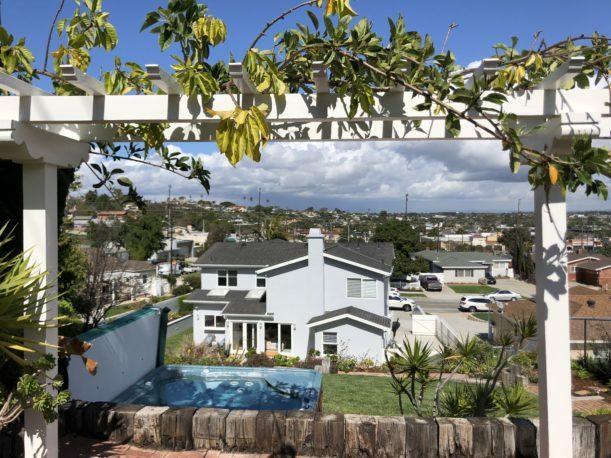 The number of homes currently in escrow is a telling sign of what is currently happening, especially when combined with the currently Active or For Sale homes in the Hollywood Riviera right now. There are 19 homes currently listed for sale in our MLS area 128 / Hollywood Riviera. This time last year – September 2017 – there were only 8. So our inventory has doubled and what is in escrow is less than half of what it was this time last year. I would argue that there are many homes currently for sale that are over-priced and that doesn’t help the situation. The word on the street would alert you to the fact that the market is ‘softening.’ The numbers above would seem to concur. We shall see what happens as we continue the rest of 2018. Coming up with average prices for home sales in the Hollywood Riviera and/or any other South Bay city can be challenging when there are many outliers in the data. Removing those outliers is really the only way to come up with a true average. For instance, one home sold in the Hollywood Riviera this year for over $22 million dollars. 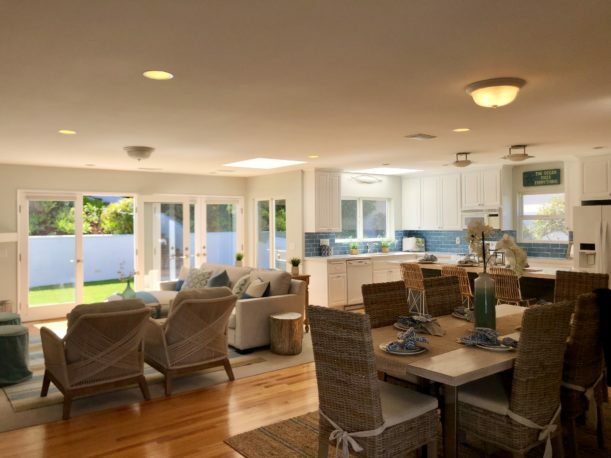 It was a very special home sitting on the bluff overlooking Torrance Beach and it was not just one home…it was two homes for the price of one! Talk about throwing off the numbers…not only was this home sold for 14 times the average price, but it was really a comparable in the area for two homes. So, if you are running numbers you must remove this sale from the data to come up with anything truly meaningful. If the average price is somewhere in the $1,500,000 range, and most of the higher end homes are now selling above the $2 million dollar mark, then really a home that sold for $3,500,000 is also an outlier. Now, it’s nowhere near the $22 million dollar outlier but it’s still out there and can throw off the numbers. Bottomline….the average price of homes sold in the Hollywood Riviera this year is way up. Our inventory is still very low…there are only 11 single family homes currently for sale. And of those 11 homes, a couple of them are way overpriced and really don’t count if you ask me. If someone grossly overprices their home, it really is not ‘for sale.’ Especially, if that individual won’t consider coming anywhere near its actual market price when an offer is received. 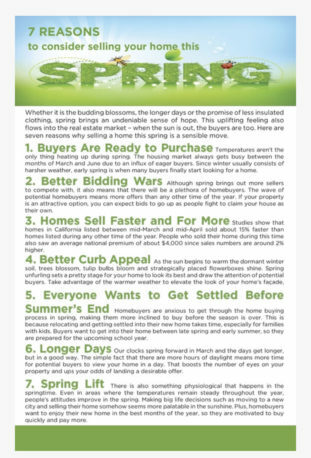 So, in fact, in my humble opinion, right now there are really only 8 out of those 11 homes that are ‘really for sale’ and priced in the zone that will garner offers from potential buyers. There are 13 homes currently in escrow in the Hollywood Riviera. So, as you can see, homes are still selling. Homes that are priced well and in good condition are still selling and often in a multiple offer situation. 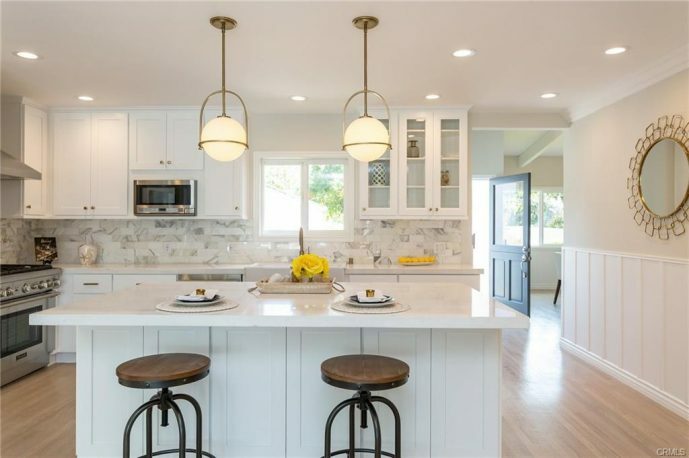 Buyers are very savvy today and the current market strategy that is working for most sellers is to prepare your home for sale – doing things like painting, de-cluttering, and other similar updates – and pricing the home right at or below its determined market value. It is best to hire a local realtor to help you determine that market value. Local realtors are much more familiar with the comparable properties and will have been inside most of those comps. Give Kelly & Laura a call today to help you get your home sold this year! This is a terrific new look for any kitchen – mix up the brass & stainless!! Looks so good when done properly! Mix up the brass & stainless – terrific look! 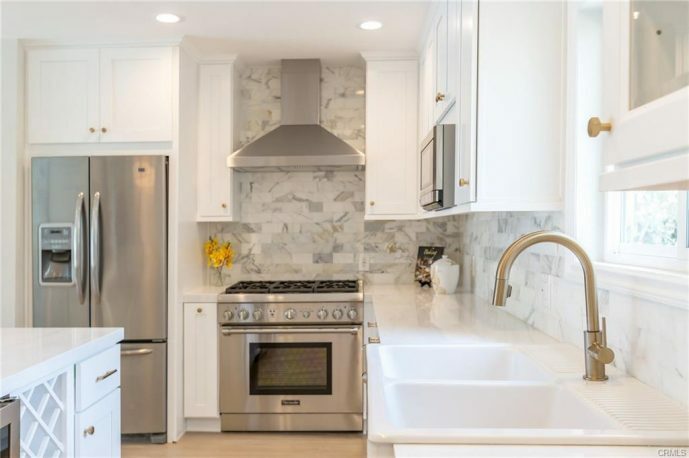 Love how open and fresh this kitchen looks!